Call us on 09-634 5962 or email us below. Visit our Product Showroom Mon to Fri 10am – 3pm. 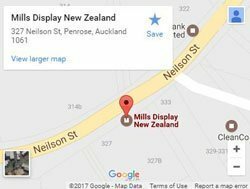 Contact Mills Display NZ – Fill in the form below to request a quote or get in touch and we will get back to you right away. Or call now 09-634 5962 to speak to a friendly sales consultant. We look forward to assisting you! We are Specialist Retail suppliers. Our diverse range covers 3,000+ products. Your first choice for visual communication and production presentation solutions. Mills Display is uniquely placed as a total retail display solution for New Zealand Retailers. Contact Mills Display NZ Today.